Director de Bont does it again, just when you thought it was safe to go back into the water. After a high-speed car chase, the film embarks with a rhythmic roll, but, in no time at all, the stormy sea breaks open and swallows endless passengers and crew members, as well as the cinema audience, into a swirling vortex resulting from the villain's premeditated plan of revenge. So, there we are, on board a boat that outdoes the Titanic (in more ways than one), tagging along with Annie and Alex as their holiday begins. About two seconds later, Annie's busy blinking her eyelashes at computer mastermind and arch villain John Geiger (Willem DaFoe) who's busy, in turn, chatting her up at the bar on deck. Alex might be jealous about the friendly tete a tete, but he'll eventually get his chance to get even. When Alex remarks about it, Annie doesn't understand what all the fuss is about; after all, what could he be, a cyber-genius with a fatal disease unjustly fired from his job who wants to destroy the ship? Don't be silly. It's the kind of film that keeps you on the line, so that every time you think things have gone as far as they can go, you discover that even more is to come. All this leads toward the ultimate moment when the ship comes in. Besides using the actual Seabourn Legend for filming, two full-scale replicas of segments were built in order to most effectively achieve the numerous effects planned. And when I say big, I mean big. 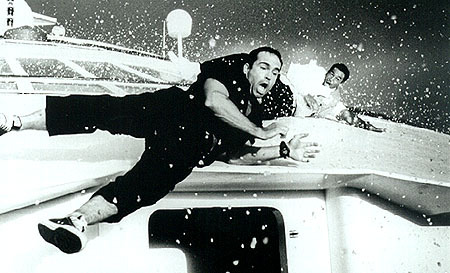 Jumping off a moving cruise liner, racing a Ducati motorcycle 30 feet into the air, being towed along in the water by a seaplane in take-off mode, being held under water with both hands tied, swimming with sharks (during shooting), battling hurricanes, are as nothing compared to the film's finale. The last scene shows rather explicitly what can happen when you want to dock as quickly as possible without any appropriate crew or decent capacity behind the steering wheel. (Similar circumstances have very recently been experienced by a vessel in New York; another case of life imitating art.) It's also includes a handy warning of what to watch out for when vacation shopping in a Caribbean harbor town. Anything else? Oh yeah, underwater kissing. Jump in, gang, the water's fine.